Top-billed actors will bring the beloved characters of McDuck Manor to life in the all-new animated comedy series DuckTales, premiering in summer 2017 on Disney XD channels around the world. Leading the quack pack on globe-trotting adventures are David Tennant as Scrooge McDuck, Danny Pudi, Ben Schwartz and Bobby Moynihan as the voices of mischief-making Huey, Dewey and Louie, respectively; Beck Bennett as Launchpad McQuack; Toks Olagundoye as Mrs. Beakley; and Kate Micucci as Webby Vanderquack. 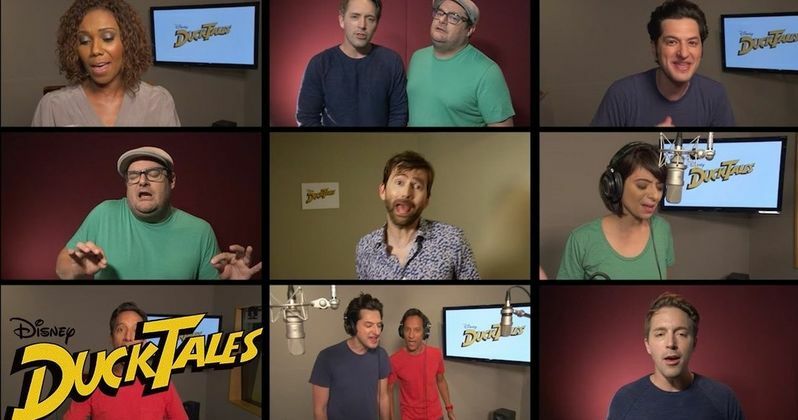 The cast was revealed today in a video of the actors singing a rendition of the original DuckTales theme song. Other beloved characters slated to appear are Donald Duck, Flintheart Glomgold, Gyro Gearloose, Duckworth, Gizmoduck, Magica DeSpell, Gladstone Gander, and Ma Beagle and the Beagle Boys. Based on the Emmy Award-winning series treasured by a generation of viewers, the new DuckTales is produced by Disney Television Animation. Annie Award nominee Matt Youngberg (Ben 10: Omniverse) is executive producer. The story editor and co-producer is Francisco Angones (Disney XD's Emmy Award-nominated Wander Over Yonder) and the art director is Sean Jimenez (Disney XD's Annie Award-winning Gravity Falls). The new series' adventures will once again take viewers along as Scrooge McDuck, his curious and mischief-making grandnephews - Huey, Dewey and Louie - and the optimistic yet temperamental Donald Duck embark on high-flying adventures worldwide. A generation's seminal cartoon, the Emmy Award-winning DuckTales led the daily syndicated cartoon block "The Disney Afternoon" with 100 episodes produced by Disney Television Animation from 1987-90. An animated theatrical film, DuckTales the Movie: Treasure of the Lost Lamp premiered in 1990. Disney Interactive features several DuckTales-themed items in the Disney Infinity toy box. A music video of the familiar DuckTales theme song (with real ducks) has amassed over six-million views since September 2014 on the popular YouTube channel "Oh My Disney." In the U.S., Disney XD is seen on a 24-hour, advertiser-supported network that reaches over 80-million households via its basic cable and satellite affiliates. In total, there are 31 Disney XD channels available in 25 languages around the world. Disney Television Animation is part of the Disney ABC Television Group at The Walt Disney Company. Alan Young, who voiced Scrooge McDuck in the original series, passed away back in May, at the age of 96. The voice actor has reprised his role as Scrooge McDuck for two Mickey Mouse animated shorts in 2015 and 2016. Now that the voice cast has been announced, hopefully we'll get to see some new footage from DuckTales before it debuts on Disney XD this coming summer. Until then, take a look at this new video with the voice cast of DuckTales singing the original theme song below.